LONDON, United Kingdom (11 July, 2011)_Men and women use different strategies to harvest forest products and this varies depending on where in the world they are located according to the recent findings of the global Poverty and Environment Network (PEN) study. For example, men are more likely to harvest poles for use in construction, while women more often harvest plants for food and medicinal purposes. 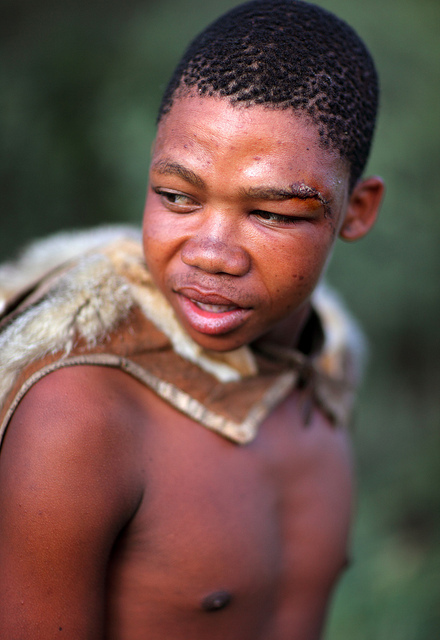 The bushmen of Botswana. Photo courtesy of Dietmar Temps/flickr. The study also found a number of interesting regional variations: in Latin America, women are very limited in their involvement in non-timber forest products (NTFP) harvests, whereas in Africa many NTFP condiments and foodstuffs tend to be traded by women, playing an important role in the household economy. The important role of women in forest management is becoming increasingly recognised as a key issue to overall quality of outcomes for forests and the environment. Governments and international bodies are awakening to the importance of a gender inclusive policy, but for any top down policy interventions to work, a greater understanding of the complex relationships men and woman play in contributing to forest-derived income and the regional variations is crucial. CIFOR scientist Terry Sunderland presented the study’s results on gender and forest use at the recent PEN policy conference held in London. Here he speaks about the complexities of gender-based forest incomes and its potential impact on policy. Which area of research have you analyzed in the PEN project? We have been looking at gender differentiations between male and female uses of the forest. In particular, the differences in terms of household and livelihood contributions. Primarily, our research of global data finds that there is a very clear distinction between strategies; men and women focus on different types of products for sale and for subsistence depending on access to those products but also based on the nature of the product themselves. For example, men are more likely to harvest poles for the construction of houses, whereas medicinal plants and plants for consumption are harvested by women – so there is a clear differentiation in the product harvested as well as a division in households between subsistence and cash. We also found a number of interesting regional variations. In Latin America, men focus on very high value products such as Brazil nuts or Acai whereas the women are very limited in their involvement in Non-timber forest products (NTFP) harvests. In Asia, the situation is more complex; women are more involved in the processing and sale of certain products, whereas men tend to dominant the sector. In Africa, women play a much more important role in NTFP collection, primarily for household use but for sale as well. Many of NTFP condiments and foodstuffs tend to be traded by women, so they play an important role in the household economy. Based on the results of the research, how can this affect policy and the rural poor? Ultimately, whether you work in research or development, we are encouraged to have a ‘gender’ component- but are we just paying lip service without understanding the complexities? I suspect that might be the case. We often try and shoe horn ‘gender’ into our activities without having a full comprehension of what it means. I think that by using research that feeds into development policy, then we can try and figure out the mechanics of how to incorporate women into the development process. A great example of a policy intervention that has encouraged income generation for women is the facilitation of female cooperatives. In Africa, the production of Shea butter is controlled by women cooperatives which are overseen by outside agencies. The men are excluded to ensure that the women receive the full benefit of the sale.